1999 was an important year for Jack Valentine because it saw his commitment to racing and dedication to the motorcycle industry being validated by the press. 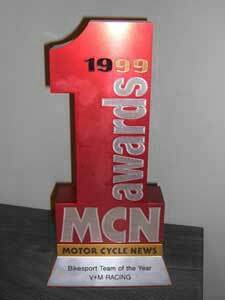 V&M were awarded the coveted Bikesport Team of the Year award by leading motorcycle publication Motor Cycle News (MCN). It was just reward for V&M's spectacular contribution to racing, particularly during that year.